TORONTO, March 11, 2016 - 2015 marked a difficult year for the Canadian economy and the challenges are expected to continue in 2016, as energy companies retrench and business investment drops with oil prices likely to remain lower than previously expected, according to the latest RBC Economics Outlook report issued today. Still, Canada’s real GDP is projected to grow by 1.7 per cent this year – a stronger showing than 2015’s 1.2 per cent rise. RBC expects another year of solid consumer activity and firmer exports to underpin growth next year. Further, the federal government is expected to announce fiscal stimulus measures in the upcoming Budget that will also provide a lift to the economy. Lower oil prices however will weigh on business investment for the second year running with RBC ratcheting down its price assumption in both 2016 and 2017. “While another year of retrenchment by energy companies will dampen 2016’s rise, manufacturing sales jumped in November and December and exports are showing signs of strength,” said Craig Wright, senior vice-president and chief economist, RBC. “The shift in the drivers of growth that began in 2015 from commodities based companies to other sectors is an essential part of the economy’s ongoing transition,” added Wright. The continuation of the transition in the drivers of growth will likely result in real GDP expanding at a slightly faster pace in 2016 relative to 2015. Against this backdrop, the Bank of Canada will keep the overnight rate at 0.5 per cent this year anticipating that as the slack in the economy eventually subsides, the inflation rate will return to 2 per cent on a sustained basis. The low Canadian dollar contributed to a jump in export volumes in December 2015 of $1.2 billion, marking just the sixth time over the past five years that monthly sales grew to such an extent. The strong upward momentum continued in January. “In 2016, firm U.S. domestic demand and a weaker Canadian dollar are expected to further support exports of autos, consumer goods, machinery, equipment and lumber and improve manufacturing conditions,” said Wright. Companies in Canada’s energy patch reduced investment in 2015 by an estimated 40 per cent as oil and natural gas prices tumbled. The tight relationship between oil prices and the Canadian dollar persisted in early 2016 and the currency slumped to a 13-year low. “An expected recovery in oil prices in the second half of the year will support a strengthening in the Canadian dollar” said Wright. The RBC Economics forecast for the Canadian dollar to end 2016 at 75 US cents. Canada’s consumers have been a key growth engine for several years and the trend is expected to continue in 2016. Home sales continued to be strong in early 2016 and the robust housing market activity fueled rising demand for mortgages. “While elevated debt holdings present a risk, the combination of a healthy labour market and low interest rates are expected to support Canadian’s ability to service debt in the year ahead,” said Wright. The outlook for provincial economies remains divided along the oil producer-consumer line. Low oil prices are expected to cause further hardship for oil-producing provinces in 2016 and therefore Alberta, Newfoundland and Labrador and Saskatchewan’s forecasts were significantly reduced. B.C. is expected to remain at the top of the provincial growth rankings for the second consecutive year with Ontario following closely behind. In the U.S., domestic demand remained solid, benefitting from still accommodative monetary policy and low energy costs. However, external demand was sluggish in 2015 and this trend is likely to persist in 2016. The sharp correction in oil prices will likely see energy companies cut capital spending, however outside of the oil and gas sector U.S. businesses are expected to respond to heightened domestic demand by increasing payrolls and raising investment in equipment and real estate. Following a choppy pattern of growth in 2015, the U.S. economy is forecasted to expand by 2.2 per cent this year. A complete copy of the RBC Economic and Financial Market Outlook is available as of 7 a.m. ET. 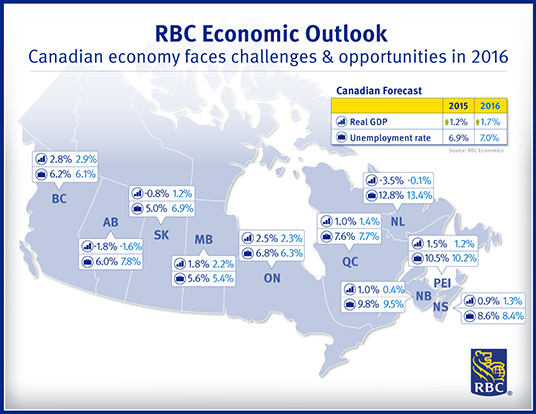 A separate public RBC Economics Provincial Outlook assesses the provinces according to economic growth, employment growth, unemployment rates, retail sales, housing starts and consumer price indices. RBC helps communities prosper, supporting a broad range of community initiatives through donations, sponsorships and employee volunteer activities. In 2015, we contributed more than $100 million to causes around the world.